It’s the kind of party that hosts love to throw and guests love to attend: a potluck. Hosts aren’t required to labor over the stove or cutting board for hours making elaborate dishes all day and then set a formal dinner table. And guests are given a chance to share their culinary expertise by bringing a dish of their own choosing (and often liking). Potlucks were initially started as measures of cost cutting and also so that work was equally divided among all. Potluck dinners are a fun get-together and great way to share the load of cooking for a large group, and also a fun chance to try the favourite recipes of your family, friends, and coworkers. 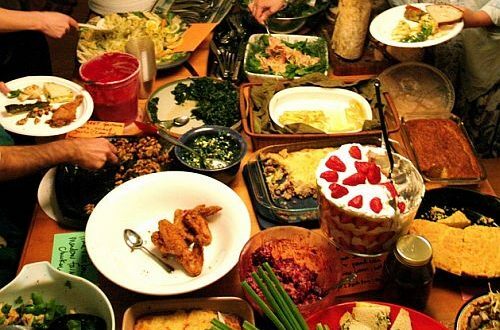 Hosting a potluck dinner also lets you be creative about making it fun and keeping it reasonable. Whether it’s a one-off or a regular event, try adding a theme to your potluck party. It gives guests a good starting point for deciding what to bring and builds in a conversation starter. Successful potlucks only require one thing: organization. 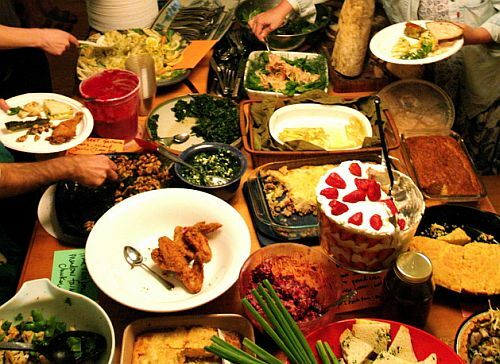 Organizing a potluck doesn’t have to be an all-consuming, onerous task. Whether you take the reins or delegate the party coordination, someone has to be on top of deciding and tracking who is bringing what. Organize everything from cutlery to location, beverages and the ideas for food. A mismatch of menu should be avoided at all costs. The host must make efforts to get the ideas about what everyone is preparing and coordinate. Decide how many dishes the meal must have. If there are too many dishes, it might become impossible to taste all. And if too little, the party goers would suffer hunger! As the host of a potluck party, when you’re inviting guests and taking RSVPs, it’s best to assign each guest a course (and then have them tell you what exactly they’re bringing to avoid dish duplication) so you have a variety of things on the menu. This will also give you the chance to talk with your guest to see if they need any special serving utensils or equipment (and same goes for guests if they expect to need a dish or special serving utensils). No one wants to discover at the last-minute that a guest has bailed on bringing cold spring rolls and has instead is carrying a lasagna that needs to be cut and served hot (especially if you’re doing a pot luck outdoors). As for the perfect potluck dish? It’s one that can be made in advance, is easy to transport, and is best served at room temperature, like deviled eggs or sesame noodles. When I’m hosting a potluck dinner in my own home, I tend to take on more challenging main dishes like a roast or a stew, while leaving the easy-to-make (and transport) salads, casseroles, and appetizers for my guests to tackle. And when I’m a guest, I try to think of dishes that are out of the ordinary and only need a spoon to serve, like a dessert or an interesting and creative salad. One great thing you can do, is suggest that guests bring copies of recipes for the dish they brought. Often people want to recreate dishes they enjoy. Be mindful of guests who may have allergies. Be sure to ask about food allergies and ask guests to put a list of ingredients on dishes. And don’t forget to remind guests to bring their dish in a disposable container. If this is not possible ask them to mark the dish somehow so that you can get it back to them. Lastly, just because you want everyone to pitch in doesn’t mean your dinner has to be informal. Send invitations — Evites are a charming (and free) alternative to purchasing and sending paper invitations. Sit down to a table set with the good china. After all, what are you saving it for? Sharing good times with friends — no matter what the bank statement says — is too important to forgo. And with a little ingenuity, it doesn’t have to cost beaucoup bucks. Keep an updated list of who is coming, who is bringing what, and you’ve got a party! At the end, Raise a glass and to toast each other’s good work. You all deserve it.